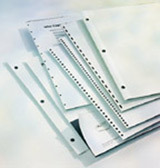 Now you can reduce your punching time and increase your productivity using these prepunched papers. Excellent for low or high volume production. These sheets will run through copiers, ink jet and laser printers. All reams are made of 20# bond paper. There are 500 sheets per ream. Available in VeloBind, Comb Binding and 3 Hole punching patterns.